What is Swag Bucks? Simply put — Swag Bucks is a search engine that awards you in the form of Swag Bucks (points that can be traded in for prizes.) You can chose from a variety of prizes including gift cards. You get 30 Swag Bucks just for joining. You then earn points each day, by doing searches, completing offers and just “snooping” around Swag Bucks. Sign up for Swag Bucks and your account will be credited 30 Swag Bucks just for joining! Use them in place of your other search engines. I actually search for my own site a few times a week and score some big points. The key is to search there frequently. Be sure to visit the no-obligation special offers every day. You will earn 1 – 3 points just for checking them out. Taking surveys is a quick and easy way to accrue some points. They can pay anywhere from 5 – 100 points for each one you take. Keep in mind that you may not qualify for a survey, so if you don’t, you won’t earn the points. But – if you do, you can get some fast points by answering a few questions. You can find the link right in the side bar from the home page. 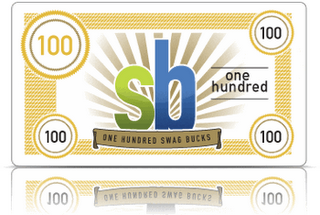 Be sure to download the Swag Bucks toolbar and use it daily. I keep myself logged in and every morning when I click on my internet, I get some bucks! You get emails, a link to the Facebook page, Twitter and even to the Swagbucks blog. I check these every day to see if there is a hidden code waiting for me. Select this and follow the prompt to download your toobar. One thing that is really great about the tool bar is that you can see your points at the top of your screen. There are sometimes special Swag Codes (which are bonus codes) that you can earn. To enter your code, you need to be on the home page and logged in. You will see a white box under your login information that reads: Enter Your Swag Code. I always copy and paste mine in. A word of caution though — don’t get extra spaces when you paste your code, or it will not work. If I find one of these, I will try to update on my Facebook page to let everyone know to check it out. You can also check out the Swagbucks widget underneath each blog post here on my site and click on the "SC" tab to see if there's a current code. Swag Bucks sends out newsletters. Be sure to always look through these as there are bonus codes hidden within them. You can check to be sure that you are signed up to recieve the newsletter by going into the main page, and clicking Newsletter on the sidebar. If you have signed up, but are not receiving the newsletters, be sure to check your Spam folder. Many times, it will drop in there. When you shop through Swag bucks, you can earn points. So, if you love to do your shopping online, try to go through SHOP (home page, see the side bar) and see if the store where you want to shop is listed. Another way to earn Swag Bucks is to trade in your old electronics. Again, go into the main page and from the side bar, select Trade In. Follow the on-screen instructions. There are always polls to complete on Swag Bucks. If you submit one and they decide to use it – you can get some points! Select polls from the side bar on the home page. It is a good idea to follow Swag Bucks on both Twitter and Facebook. They sometimes release codes through these outlets. Friday is a great day to use Swag Bucks. Rather then earning 10 points when you search, you could earn 100! It is always random, but your chances of earning more points are greater on Fridays. When you refer your friends to Swag Bucks, you can earn points! So, when they search and win – you win too! Once your referral attains 1000 points, you no longer earn anything from them, but the good part is there is NO LIMIT to the number of people you can can refer! To access your referral link, select Promote from the main screen and then on Invite Friends & Earn. Then, you can choose the way you wish to promote (Facebook, direct link, widget). Bucks for Amazon Gift cards. You can purchase them in varying amounts, which makes your gift card total build up rather quickly. You are limited to purchasing 2 prizes daily, with a limit of 5 of any one prize monthly. So, if you love the $5.00 Amazon card, you will only be able to purchase $25 worth in any given month. There are HUNDREDS of prizes. To find yours, you can select Swag Store from the home page and take a look around. Now, if you’d rather have the gift cards (note that most of them are e-gift cards, so you will NOT get anything in the mail). It can take a few weeks for the gift card to be posted to your account, but you will get an email advising you of this. They advise that they post cards on the 16th and 30th of each month. It can be delayed due to a holiday or weekend that might occur at the same time. If you purchase Amazon cards, you can add them to your account and they will be sitting there waiting for you for the moment you are ready to use them. Now, you have that balance recorded in your account. You can add as many cards as you would like – no limit. Then, when you shop, your purchase is deducted from the gift card total and you pay only the difference (if any). So, that’s how it works. I know it seems like a lot, but it is really easy and FUN to earn free stuff!